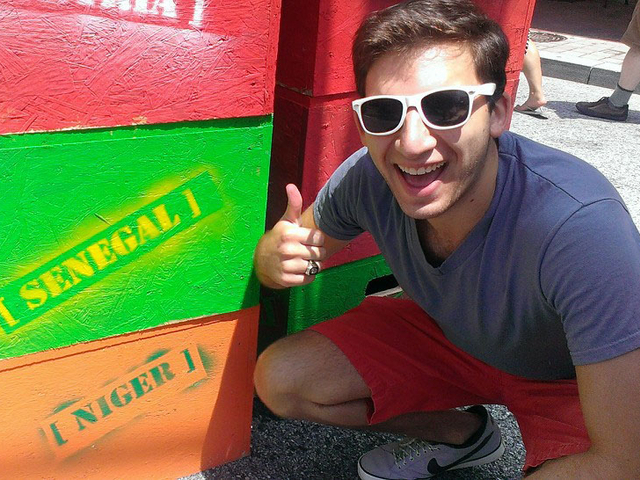 Nathan Rehr ’13, Political Science, will begin serving as a volunteer with the U.S. Peace Corps in March, 2014, in Senegal. I have known for about four months that in March, I will be leaving to serve as a community health volunteer in the U.S. Peace Corps but it probably won’t feel real until I board the plane to Senegal (although I imagine I will feel something when I am getting all my vaccinations). I pretty much settled on joining the Peace Corps in my senior year of high school. That was when I undertook a project for National History Day, kind of like a science fair competition but for historical research. Having recently worked with a returned volunteer, I was curious to know who had started the Peace Corps. Almost immediately after beginning my National History Day research, Sargent Shriver became one of my heroes. Shriver was a textbook idealist. He was given the task of getting Congress to approve the Peace Corps when everyone thought it was impossible. But more than 50 years later, Shriver’s idealism lives on in the Peace Corps, the Special Olympics, and War on Poverty programs like VISTA and Head Start. To learn more about Shriver and his legacy check out his biography and this reflection written by his son. When I learned that UMBC had a Shriver Center to connect students to service-learning opportunities, a Shriver Living Learning Community where students participating in service lived together, and the Sondheim scholarship program for students interested in public service, I was sold. I participated in service throughout my time at UMBC. I studied International Affairs and studied abroad, giving me even more of an international focus. On one level, Peace Corps just makes sense. It combines my passion for volunteering and my international education. I’d also like to think that I’m joining for the same reasons that Sargent Shriver was dedicated to launching the program: helping others secure the basic necessities for human life and promoting cultural exchange. I hope that my time as a volunteer will give me the first-hand knowledge necessary to improve the way we approach international development. I guess I’ll know more in another four months when I step off the plane and into… well I don’t really know what but I know it’ll be an adventure. Contact the author, Nathan Rehr at nathanr2@umbc.edu. Super exciting, Nathan! You’re in for an adventure! Good Luck to you! Let us know of your experience! I’m jealous! And so happy for you…Senegal will be a fabulous new home!